SANTA RITA, Guam - Capt. Eric C. Correll relieved Capt. 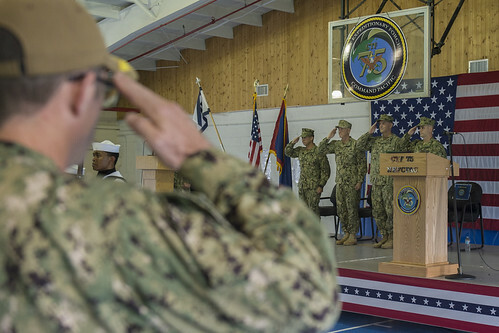 Robert Baughman as Commander, Task Force (CTF) 75 during a ceremony onboard Naval Base Guam, Oct. 26. Rear Adm. Brian Brakke, commander of Navy Expeditionary Combat Command (NECC), presided over the ceremony and praised Baughman for his excellence in leading the CTF 75 team of over 1,200 expeditionary Sailors and welcomed his successor. In addition to exercise support, Baughman led the U.S. Navy through its first ever partnership with Sri Lanka during Cooperation Afloat Readiness and Training (CARAT) 2018. Baughman was grateful of his opportunity to lead CTF 75. Upon assuming command, Correll wanted to make it clear the mission of CTF 75 has not changed.